It was quite an upset. 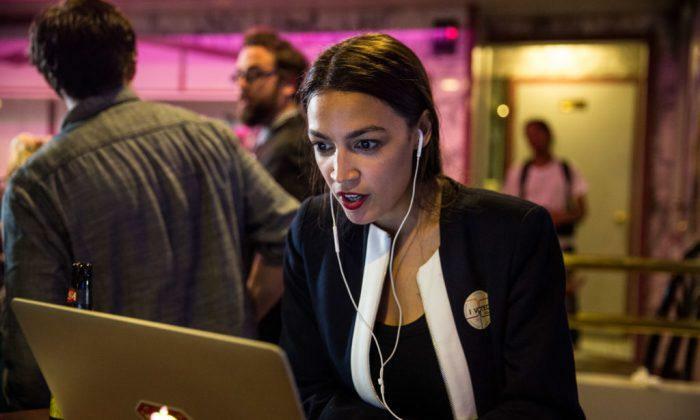 The leftist Alexandria Ocasio-Cortez beat a more moderate democrat Joe Crowley in a New York primary for the house of representatives in June. Given New York’s preference for democrats, this result all but assures her of a seat in the House come midterm elections. What prompted the 16,000 primary voters (out of 292,000 eligible in the Queens/Bronx 14th district) to vote for Ocasio-Cortez over her competitor, who only got 11,800 votes? Free stuff and anti-Trump rhetoric. Free education, medical care and a federal jobs guarantee (free stuff), as well as the abolishment of Immigration and Customs Enforcement or ICE (anti-Trump). “I understand the economic crises people are facing in New York City; we can’t afford to live in the neighborhoods that our families have called home for generations, including my own family,” she told Vice News. But her own family background is far from “working class” as she describes on her campaign page, as the Daily Mail reports. Although Cortez was born in the Bronx and lived there until age 5, her father—an architect who ran his own business—moved the family to posh Westchester County, where she attended Yorktown high school. Cortez, who attended Boston University, only moved back to the Bronx after her father died, making money as a waitress and bartender—working class after all. Either way, for her and her family, the days of not being able to afford living in the Bronx, or anywhere else for that matter are most likely over. If elected representative, Cortez will enjoy the benefits of “earning” $174,000 base pay for 120-150 days of “work,” a budget of $1.2 million for staff and travel expenses, as well as insider trading privileges. If she is smart, she can use some of that free time to take lessons from Democratic Rep. Judy Chu from California, who built up a net worth of more than $3 million day-trading the S&P 500 with call and put options since her first election in 2009. Not bad for 16,000 votes; and at least one Bronx family won’t have economic issues again for the near future. Of course, it remains to be seen how many people turn out for her in this year’s midterm election. As for her politics, Cortez demonstrates the same delusional lack of understanding of history and economics that other socialists exhibit, most recently and notably Bernie Sanders. “I don’t believe that in a moral and wealthy America, people should be too poor to live,” she told Qatari-funded AJ+. This is why she promises the free stuff for poor people, as well as government job guarantees. “I will not compromise on the future that I think is best for this country,” she tells Vice. Given these statements, it sounds awfully like she thinks she is the wise central planner who knows what’s best for everybody. The wise central planner who so far has never materialized for all socialist and communist societies and has brought about misery and death. That this lesson of history is lost on Cortez and her backers of the Democratic Socialists who openly state that “communism is good,” is sad but hardly surprising. It is more surprising Cortez hasn’t noticed that the city of New York, where all those poor people who can’t afford to live in the houses they wish to live in, has mostly been ruled by democratic mayors since the 1850s, with the occasional Republican in between, —mayor Bloomberg notwithstanding. It is similar though less clear cut for New York State. Or may we say she hasn’t noticed because she lived most of her life in Westchester County rather than the Bronx? 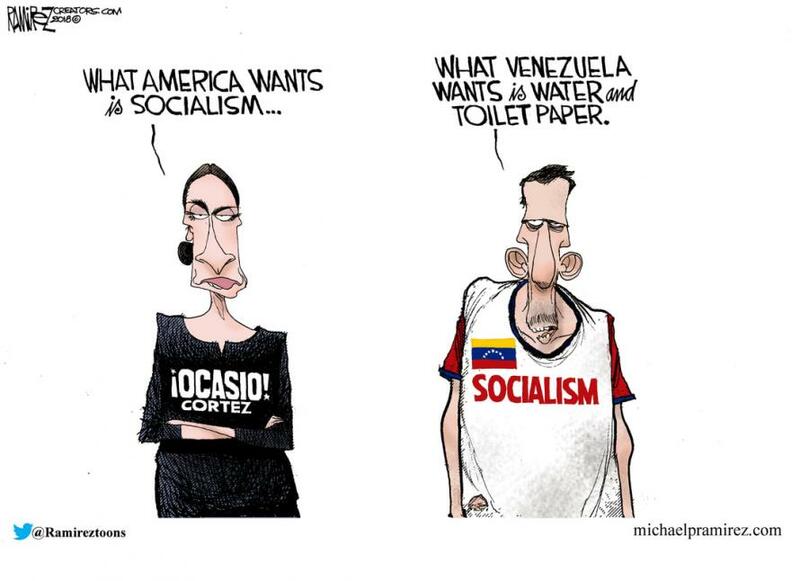 Either way, her policies reflect the same socialist delusion, whether it’s on the local or federal level: The problems of poverty and unaffordable housing, according to Cortez, don’t exist because of the thousands of failed government initiatives but because there hasn’t been enough of them. Of course, the subtleties of supply and demand, as well as investment and production, are probably lost on Cortez, but let’s go through the example of real estate, which is a good one. Let’s start with the basics. Real estate prices are high because of a corrupt monetary system, supported and sanctioned by the state. The Fed and private banks print money out of nothing which goes to them and their cronies first. They buy up assets like stocks and real estate on the cheap while the working man’s wages go up last, if at all. Because money can be created out of thin air by private banks, and the state accepts it as payment for taxes, this is not free-market banking, but rather a corrupt private-public hybrid more akin to Marx’s centralization of money and credit than to Rothbardian free and fully-reserved banking. In case something goes wrong in this operation, like it did in 2008, the state stands ready to bail out the private banking system with taxpayer money voted for by Democrats and Republicans alike. Although Cortez is critical of Wall Street, her vision of the banking system probably will eliminate private banks altogether and fuse them with the state. The outcome of that operation certainly won’t be pretty either. Second, decades of city interference in the housing market has punished private developers who want to build affordable housing of lower quality. Why? Because the city, through rent controls, sets prices too low which always and by definition leads to shortages in supply of the desired product. Let’s say to recoup investment and make a modest profit, a developer needs $100 in rent per month from an affordable housing unit. If the city says the maximum he can charge is $50, there won’t be any development of affordable housing. Since the developer doesn’t want to give up his job, there will be more development of real estate where the regulations don’t apply, like the thousands of luxury condos currently under construction in Manhattan funded by money created out of nothing in the state-sanctioned, fractional-reserve banking system. Alexandria Ocasio-Cortez’s victory highlights many problems in our democracy. It’s a perfect case of how a young, inexperienced, and completely uneducated person in business and economics can come close to wield a budget of $1.2 million just by promising people free stuff. But this is only natural. It is natural for a 28-year-old to want to help others by taking from the productive without doing anything herself. It is also natural for voters to look outside for help rather than trying to change their life situation by their own doing. Socialism appeals to the dark side of human nature, robs it of agency and responsibility, and always leads to hunger, misery, and death. It is up to the responsible citizen to make sure this doesn’t happen in the United States by voting to prevent people like Cortez or Sanders from coming to power.